A Healthy Lawyer is a Better Lawyer. Attorneys are exposed to a variety of stresses in their profession, which can take a toll on their mental and emotional well-being. Perhaps not surprisingly, lawyers have been shown to abuse substances and suffer mental health issues at higher rates than other professionals. The bar hopes this page will be a resource for information on staying healthy – in your practice and out. This organization provides free, confidential, non-disciplinary help to Virginia's legal professionals and their families struggling with substance abuse, addiction, depression, stress and anxiety, and other mental health issues. 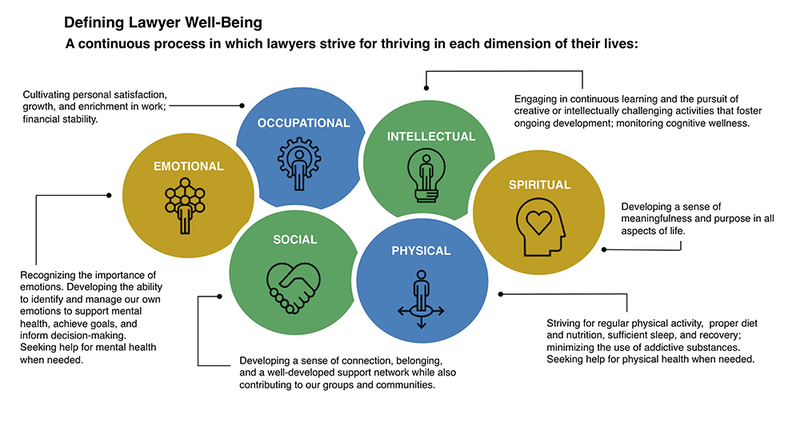 "The Path to Lawyer Well-Being"
In August 2017, Supreme Court of Virginia Chief Justice Donald W. Lemons was one of 15 authors of a report, “The Path to Lawyer Well-Being: Practical Recommendations for Positive Change.” And in September 2017, Chief Justice Lemons announced plans to form a committee in Virginia to find ways to enhance lawyer well-being. Supreme Court Justice William C. Mims, who has written on the topic for Virginia Lawyer magazine, chairs the committee. An Open Letter From a Sidley Partner's Widow, The American Lawyer (subscription required), November 12, 2018 - Joanna Litt’s husband, Gabe MacConaill, a 42-year-old partner at the firm, committed suicide in the parking garage of their downtown Los Angeles office last month. Living Above the Bar - a series of videos by the State Bar of South Dakota about wellness. Cognitive Self-Assessment Tool - a Self-Administered Gerocognitive Exam (SAGE) developed by the Ohio State University Medical Center. The SAGE is designed to detect early signs of cognitive, memory, or thinking impairments. Results of the exam should be discussed with a physician if there are any concerns.